And it feels good to have you back here! The tulips are so so pretty. 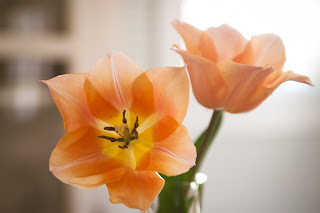 The peach tulips are beautiful. I've never seen that colour before! Gorgeous photo, and it's so good to have you back! I love when you post. Good for you, Anna - you're always doing and growing. A trip to see Giles - that means going to Purl Soho?? So nice to have you back! Pretty tulips! What an exciting time for your family. The flowers are lovely. Good to see you back! So delightful! So lovely! So creamy and peachy and sweet! Ahh..the lucky bee...thank you!